Sure, early hominins used fire for upwards of a million years. But when did early hominins start acting like humans—for example, cooking in the same spot each night? 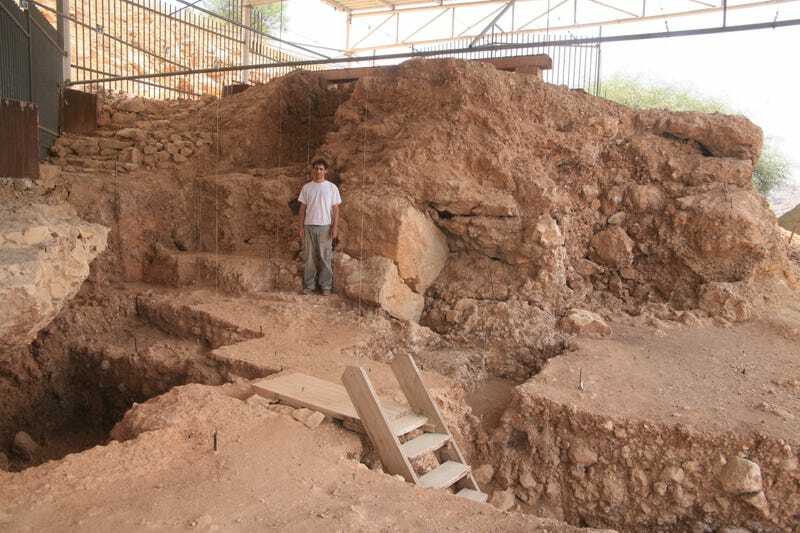 The new discovery of an old (really old) hearth at an Israeli dig site could hold the answer. The site is Qesem Cave—Qesem meaning "magic" in Hebrew—a dig that's been ongoing since 2010, when the cave was discovered outside of Tel Aviv. The subsequent haul of discoveries, from teeth to tools to actual hunks of meat, were widely misinterpreted online as "doubling the age of our species from 200,000 years to 400,000 years," a misunderstanding that science writers like Carl Zimmer cleared up by pointing out that the inhabitants of Qesem weren't Homo sapiens—rather, they were early hominins. Still, archaeologists are interested in the site because, eventually, these early species evolved into modern humans. So how did the dig team discovery a hearth so old? After all, it's not as if it had a mantel and fire tools to identify it. They describe their process in a paper published in the Journal of Archaeological Science this week. First, archaeologist Dr. Ruth Shahack-Gross used infrared spectroscopy to find a "thick layer" of wood ash on the floor of the cave, which turned out to include bits of bone, too. She took what amounts to a "biopsy" of the hearth, cutting out a small cube and hardening it in her lab. Then, almost like a doctor slicing a brain, Shahack-Gross sliced the sample into super-thin sheets, which she could study under a microscope. What she found was "micro-strata," tiny layers of ash, which prove the spot was used over and over again as hearth. In other words, evidence that the 300,000-year-old humans who lived in the cave had domestic rituals—and those rituals are more important than you'd think. Archaeologists have long sought to identify the exact point in time when neolithic humans evolved into modern humans (general consensus estimates it happened 400,000 years ago). Speaking in pop culture terms, most of us think of the opening scene of 2001: A Space Odyssey, in which an early hominin realizes he can use an animal bone as a tool—and we see the "birth of man." These findings help us to fix an important turning point in the development of human culture—that in which humans first began to regularly use fire both for cooking meat and as a focal point—a sort of campfire—for social gatherings. They also tell us something about the impressive levels of social and cognitive development of humans living some 300,000 years ago. So the answer to figuring out when Homo sapiens walked the earth isn't just physiological—in teeth or bones—but behavioral. It seems there's something to be gleaned in how we inhabit a space, too, a behavior that Martin Heidegger inadvertently described in a 1951 essay about architecture with the words "Building, Dwelling, Thinking."